Italian and Bulgarian translations have been updated, and they are now available for the gvSIG 2.1 final version, thanks to Antonio Falciano (Italian), and Zahari Savov and Jordan Tsvetkov (Bulgarian). If you installed the gvSIG 2.1 final version, you can update these languages now from the add-ons manager. From gvSIG, you have to go to Tools->Addons manager, then select the Installation from URL option and finally you have to select the “Official gvSIG repository for this version” option. When packages appears at the window you have to select the “Internationalization” option at the left side, and then the “Translations” package (1.0.0-27 version). After installing it and restarting gvSIG the translation will be updated. 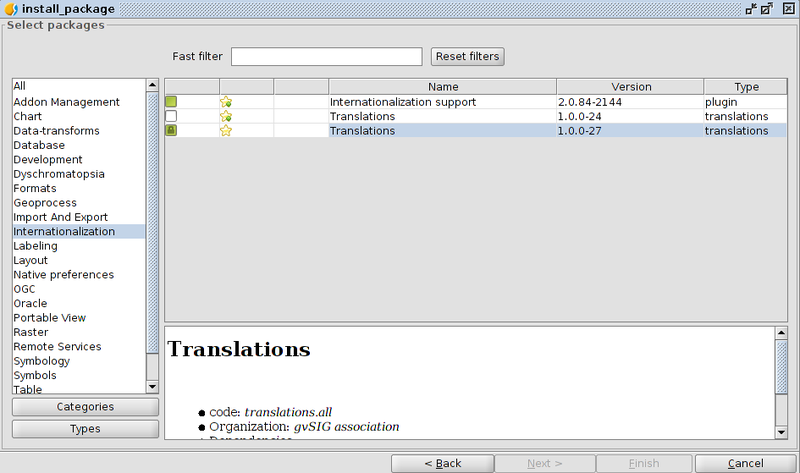 We encourage you to translate the gvSIG interface to new languages or update the existing ones. If you are interested you can contact us (mcarrera at gvsig.com). This entry was posted in community, english, gvSIG Desktop. Bookmark the permalink.